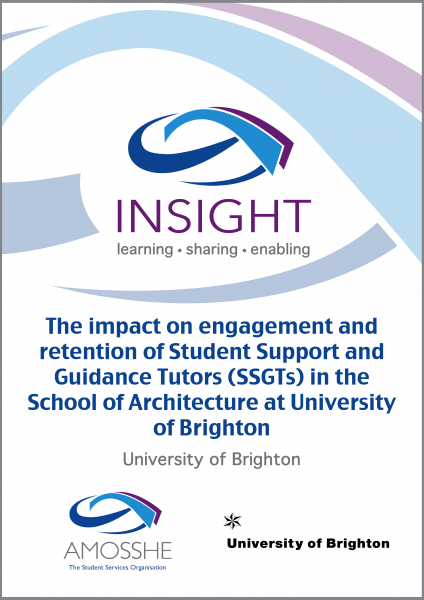 This project, undertaken by the University of Brighton, aims to assess the impact of Student Support and Guidance Tutors (SSGTs) on student engagement and retention. Principal investigators: Clare Hughes, SSGT Manager, and Justine Devenney, SSGT in the School of Architecture. Total award from AMOSSHE: £2,500. An SSGT has been in post in the School of Architecture since summer 2013 with the aim of enhancing student engagement and retention within the school. SSGTs are line managed within Student Services but are located in schools, and are very much part of the culture of the school. They work in a complimentary way with personal tutors but their role is not an academic one. The work they do is an integral part of the university's Strategic Retention Improvement Plan and in line with the recommendations from "What works? Student Retention and Success Programme". SSGTs work in a variety of ways, offer front line support and act as "sign posters" to more specialist services across the university. The aim of the project is to assess the impact of the SSGT within the school with a view to developing the role within Architecture and in addition to other areas of the university. The project aims to obtain evidence about the efficacy of the model that the university is using with regard to SSGTs, particularly with regard to enhancing retention, which is above benchmark within the school. This is a relatively new development at University of Brighton and the first time the School of Architecture has had such a service for its students. Working with data to ascertain comparative data with regard to student non-continuation pre- and post-SSGT. Working with data from Student Services as to take up of specialist services (for example, counselling, disability services) pre- and post-SSGT. Working with the Students' Union to ascertain their involvement with Architecture students pre- and post-SSGT. Both the advocacy and advice service within the Students' Union will be examined using data and Students' Union verbal evidence. Working with student focus groups to assess understanding of the SSGT role. Working with first year students and separate sessions with students in other years to compare their understanding and uptake of support. Working with focus groups of personal tutors to assess their views as to the impact of the SSGT role. Collection of information from students who withdraw from the course to provide a clearer understating of their reasons for withdrawal. A report with qualitative and quantitative analysis from findings, with recommendations based on this research for enhancements, developments and possible expansion of the service. Good practice guidelines for dissemination across the university. Guided discussions and focus groups. Co-working with other Student Services departments. Change of practice in schools to accommodate SSGT good working guidelines. Understanding of the perception students within the School of Architecture have of the SSGT role. Understanding of the impact the SSGT role has on the wider Student Services. Analysis of data to show patterns of retention when direct involvement with students in schools is provided. Understanding of good practice with regard to role of SSGT in schools as a model to be used to enhance retention at University of Brighton and the wider university sector.